Eaga Warm Front £300 rebate scheme. As registered installers of Eaga we can offer our customers the Warm Front Scheme which is a Government based scheme which can offer you £300 off your new boiler installation. Since 2001 Warm Front has helped thousands of people receive insulation and heating improvements to make their homes warmer, healthier and more energy-efficient. On Monday 5th December 2005, the Chancellor made a pre-budget announcement regarding the Government's intention to offer a £300 grant to pensioners who would not otherwise be eligible for Warm Front. If you are over 60 and would like to see if you qualify for the Warm Front scheme then all customers can apply via the eaga contact centre. You can either contact them via 0800-316-2808 Monday-Friday from 8am-6pm and on Saturday from 9am to 5pm or you can contact them at the following address: - Eaga plc, Freepost NAT 13708, Newcastle upon Tyne NE2 1ZL. You do not need to use a stamp. 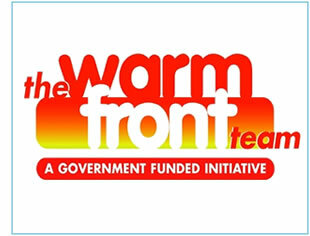 Customers who are not eligible for Warm Front will be registered for the Warm Front £300 Heating Rebate Scheme. There are 3 stages to the Warm Front Scheme – Application, Installation and Redemption. To find out more details please visit www.warmfront.co.uk. The boiler scrappage scheme is a new Government scheme which can entitle you to Get £400 off a new A-rated boiler or renewable heat technology, when you scrap your old, inefficient G-rated boiler. The scheme is open to 125,000 householders in England living in an owned or privately rented home. To see if you qualify and for more information regarding the boiler scrappage scheme you can visit www.energysavingtrust.org.uk. A good quick test for gas boilers is to see if it has a permanent pilot light -if it has then it is very likely to be a G-rated boiler. If it is gas fired and over fifteen years old it is likely to be eligible. If it is oil fired and over twenty five years old, it is likely to be eligible. If you believe that your home has a G-rated or worse boiler and wish to register for the scheme to receive a £400 cashback voucher towards the cost of upgrading to an A-rated boiler. Then firstly you will need to arrange for us to visit and provide you with a quote - click here. Once you have the quote then you will need to complete the online web form on the Energy Saving Trust website www.energysavingtrust.org - or contact them by calling their advice line on 0800 512 012.